GEODIS’ highly structured customer segmentation strategies, strong innovation culture and active Corporate Social Responsibility strategies serve the efficiency of its full-fledged portfolio of services. (Levallois-Perret, France, June, 28) – GEODIS, a worldwide leader in transport and logistics, was recently recognized as a Leader by Gartner, the world’s leading information technology research and advisory company, in its May 2018 Magic Quadrant for Third-Party Logistics, Worldwide. GEODIS has five Lines of Business (Supply Chain Optimization, Freight Forwarding, Contract Logistics, Distribution & Express and Road Transport), which manages its customers supply chain by providing end-to-end solutions enabled by its people, its infrastructure, its processes and systems. GEODIS’ service portfolio is strongly supported by the highly structured customer segmentation strategy that clearly defines how the company supports and adds value to each customer segment. George Gourdomichalis, new Chairman of the American Club, of Phoenix Shipping & Trading S.A.
P & I and FD & D entries grow by 8% and 6% respectively during 2017. Headline premium declines by 5% to $98.7 million, but incurred losses fall by nearly 50% to $36.3 million. 2017 policy year claims emerging more favorably than previous year. Pool exposures continue at moderate levels. Investment portfolio generates an 8.1% return, best in nearly a decade. GAAP and statutory surpluses increase year-on-year, by 12% and 13% respectively. New reinsurance program affords Club excellent net loss protection. 2018 policy year claims developing very modestly at early stage. 2015 policy year closed and $12 million surplus transferred to contingency account. 2016 policy year release call margin reduced from 15% to 10%. Eagle Ocean Marine maintains steady growth with excellent profitability. American Hellenic Hull continues to expand its market footprint. Safety and loss prevention initiatives gain further momentum. Arnold Witte and Markos Marinakis retire as Chairman and Deputy Chairman of the Club’s Board. George D. Gourdomichalis of Phoenix Shipping& Trading S.A. elected as new Chairman, with Robert D. Bondurant of Martin Resource Mgmt. 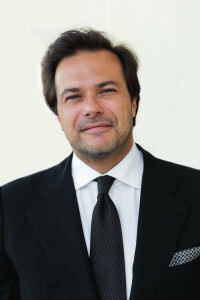 Corp. as Deputy Chairman. “K” LINE Group is continually engaged in environmental activities following the PDCA cycle while ensuring environmenal compliance. In order to realize our desirable future expressed i n “K” LINE Environmental Vision 20501, our long-term environmental management vition, we commenced a new environmental management system, “DRIVE GREEN NETWORK (DGN)” in 2017 and obtained a statement of conformity2 for DGN from a third-party insutitution, DNV-GL this March to put it on the right track. In this regard, it was decided we should create a logo for symbolizing our environmental activities and hence, after gathering opinions within the Group, we selected the one shown below. We hope the logo will help let many people become aware of our ongoing DGN activities and further advance our Group-wide efforts. The logo was officialy presented during the reception held on June 5 for “K” LINE Group Environmental Awards 2018,” which is also World Environmental Day, and has been in use since June 6. 1 Please see the following URL for the details of “K” LINE Environmental Vision 2050 – Securing blue seas for tomorrow –. 2 Please see the following URL for the details of the obtaining of a statement of conformity from DNV-GL. After a successful initial pilot phase at the Lille Europe site in Lesquin, GEODIS has outfitted its Distribution & Express platform in Rennes (Brittany, France) with LED lighting and connected sensors. The objectives are to reduce electricity consumption, improve employee well-being with more natural lighting, optimize building temperature, better organize space for storage and flow management, and strengthen the safety of goods. This IoT (Internet of Things) technology, designed in partnership with the company Enlighted delivers light fixtures, developed by Le Studio Led, that adjust according to ambient light levels or movements of people, thanks to their connected sensors. The installation and configuration are very simple and can be controlled remotely. Recently equipped with 764 sensors and 921 light fixtures, the Rennes site (16,500 sqm) cut lighting costs by more than 85% in the first month of operating. Since the installment of this new equipment at the Rennes site, the entire workforce has noticed an improvement in visual comfort, because the intensity of each light fixture is customizable and adjustable according to natural light levels. Moreover, this system enables real-time geo-tracking of goods on site, which is a real asset in terms of freight security. “This system, which offers many advantages, will also allow us greater control over our operating costs and more dynamic management of our real estate,” indicated Stéphane Cassagne, GEODIS Corporate Secretary, in charge of company property. GEODIS is a worldwide leader in transport and logistics operating directly in 67 countries and serving 120 countries through its agent network. In 2017, GEODIS generated €8.1Bn in sales with 40,500 employees worldwide. June 14, 2018 – Evergreen is expanding its container transport choices for customers between Asia and Australia by teaming up with Hyundai Merchant Marine (HMM) and APL to provi de a new weekly Central & South China-Australia Express (CAE) service. 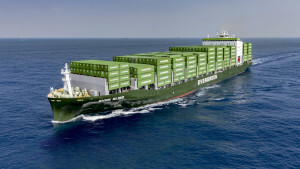 Five classic Panamax ships with capacities averaging 4,600 TEU will be deployed on the new service, two will be operated by Evergreen Line and the remaining three by HMM and APL. The first sailing is scheduled around mid-August, with regular port calls at Ningbo, Shanghai, Yantian, Sydney, Melbourne and Brisbane. June 11, 2018 (New York): Portcare International Ltd. and Vooss Hanemann Associates, Inc., have been chosen by Evergreen Line to represent its public relations and advertising interests within North America. Portcare International has catered to the needs of the transportation industry since 1997. Based in the UK, Portcare has represented Evergreen within Europe as part of its client portfolio since 2013. Peter Owen, Managing Director of Portcare said, “The institutional knowledge we lend to the efforts of each of our clients within the transportation industry allows us to become a valued partner in the successful presentation of their business. It is a great honor to broaden our footprint of service to Evergreen by including their North American concerns.” Mr. Owen had previously served as publisher of Containerisation International, a leading provider of news to the transportation industry. Vooss Hanemann Associates, founded in 1994, provides public relations, advertising and marketing services to clients across a wide range of industries. Michael Vooss, president of Vooss Hanemann, will provide Evergreen’s day-to-day needs from the agency’s New York office. Mr. Vooss previously served as Director of Advertising and Public Relations at Lykes Bros. Steamship Co., Inc., which had operated a fleet of more than 30 container and multi-purpose vessels. Award Ceremony held for “K” Line Group Environmental Awards 2018 on June 5, 2018. The awards were established to honor and give recognition to outstanding environmental-preservation-contributive activities addressed by executives and employees working throughout the “K” LINE Group pursuant to the direction developed in “K” LINE Environmental Vision 2050. This year, which marked the 4th time since establishment of the awards in 2015, we also accepted many entries from our group companies both in Japan and overseas. Activities of six companies and one volunteer group — one for “Grand Award” and six for “Excellence Award” — were selected from such standpoints as “originality,” “challenge level,” “degree of contribution,” “continuity” and “potential for pervasiveness” with representatives from these companies and group receiving the awards from our President and CEO, Eizo Murakami. In addition to these existing awards, we newly established a “Sustainability Award” this year. This additional award was created to recognize companies or groups which aggressively engage in environmental activities under the principle of “K” LINE Group’s Environmental Promotion System: DRIVE GREEN NETWORK (DGN) that was started last year, and we selected two companies this year. The “K” LINE Group will continue to broadly share environmental preservation activities addressed within respective Group companies in order that we can further advance dissemination and enlightenment of environmental preservation activities as an entire Group effort through “K” Line Group Environmental Awards. Through this emphasis on continuing to aggressively contribute to environmental preservation and biodiversity protection, we should successfully accomplish our mission, i.e., “Passing down a sustainable society and this blue and beautiful ocean to the next generation” expressed in “K” LINE Environmental Vision 2050. KMDI developed a carrier car (truck carrier) which was able to load four small trucks in tandem with its client, PT Hino Motors Manufacturing Indonesia (HMMI) and has been in operation since February 2017. HMMI used to consign trucks (products) at the factory and since many of these traveled on their own, it was concerned about troubles such as damage during transportation. By developing the truck carrier, KMDI succeeded in decreasing the number of vehicles running on a road and that realized, combined with improvement of transport quality, reduction of fuel consumption. Furthermore, thanks to the cooperation of PT. Hino Motors Sales Indonesia (HMSI) that is a truck dealer, the carrier has been used for domestic long-distance delivery in their business. “K” Line Ship Management (Singapore) Pte Ltd.
Kempten, June 4, 2018. As the groupage leader in the German and European markets, Dachser operates a close-knit overland transport network. But the logistics provider’s closely integrated groupage network extends to sea freight, too. 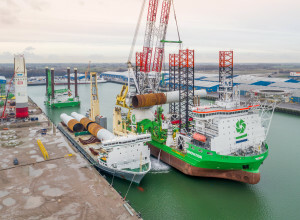 In 2018, 26 new LCL (less than container load) connections will be launched. For six of its existing services, Dachser is increasing the frequency of departures from every two weeks to every week. Dachser sees great potential in expanding its sea freight network for Dachser Interlocking: thanks to the close collaboration between Dachser Air & Sea Logistics and Dachser European Logistics, the company can offer its customers fully integrated logistics solutions comprising transport, warehousing, and value-added services. Dachser handles pre-carriage through its comprehensive European network and is passing the benefits of grouping shipments on to its customers. Shipments can be tracked continuously from the supplier in Europe to a recipient anywhere in the world. 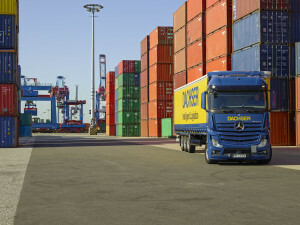 A family-owned company headquartered in Kempten, Germany, Dachser offers transport logistics, warehousing, and customer-specific services in two business fields: Dachser Air & Sea Logistics and Dachser Road Logistics. The latter consists of two business lines: Dachser European Logistics and Dachser Food Logistics. Comprehensive contract-logistics services and industry-specific solutions round out the company’s offerings. A seamless shipping network—both in Europe and overseas—and fully integrated IT systems ensure intelligent logistics solutions worldwide.